Presenting Soulprint by Megan Miranda. Alina Chase has spent her entire life in confinement. With the science of soul-printing now a reality, she is 'protected' for her own safety - and the safety of others - because her soul has done terrible things ...or so she's told. When Alina finally breaks out of prison, helped by a group of people with unclear motives, she begins to uncover clues left by her past life that only she can decipher. And she may not be as innocent as she once believed. Can Alina change her future, or is she fated to repeat her past and face the consequences? Reincarnation. A topic that has eluded from young to old to the plethora of religious beliefs throughout the planet. Do good deed in the present life and you are guaranteed a better one in the next birth and the vice versa also holds true .... so is the general belief. Whatever skills you accumulate in one life you are believed to carry it over in the next .... Nobody really knows who they were or what they were before ..... Is s along these lines that author Megan Miranda constructed this soulful masterpiece called 'Soulprint'. Running from her soul ..... This is the story of 17 year old Alina Chase literally running from her soul, her past life as June Calahan. Detained in isolation since her soulprinted Alina has only ever known the island and her secluded, defying her detainers in subtle secretive manners as much as she could. Always on the lookout for help and escape .... she finally manages so with the help of strangers Cameroon & Casey London and the mysterious Dom. Thus loading to new experiences, unclear motives, shocking (yet expected) betrayal and a soul searching journey as Alina Chase starts to unravel clues that may or may not have been left by her past self. I must confess the first half of the book stretched my patience a bit but then the clues became a bit clearer I began to enjoy the book very much and by the end of it had much to appreciate in it and questions to ponder on. I like books that evict such feelings and appreciated Megan Miranda's Soulprint a bit more. What really happens when a person dies? Should a person be incarcerated if he/she is found to be the soul of a criminal in their past life. And the hypocrisy of humanity to punish a person when they haven't done anything wrong .... Nature vs. Nurture. While Cameroon, Casey & Dom appeared in the beginning in their bid to help Alina escape I liked our protagonist (Alina) the best. She grows, she learns and she assimilates the changes around her at a fast pace and learns to make the distinction between right and wrong ... Judging a book by its cover ..... rather judging a person by their soul, Miranda's thrilling and suspenful tale brings out the weakness and strength of human nature, so marred by emotions. 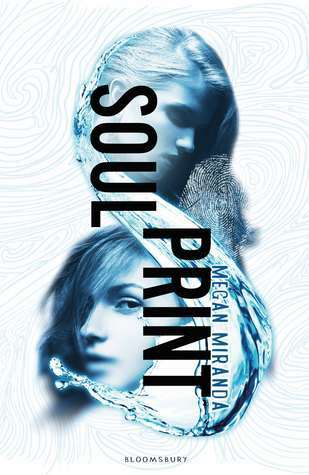 With lots and lots of action, some twists & turns, decidedly sweet romance and biting truths & betrayals, Megan Miranda's Soulprint proves to be definite gem of literary extravaganza. "A progressive thriller with a unique plot to boot"
I thought it was probably longer than it needed to be. I like this cover better than the American one!